Are you a developer or lover of technology? 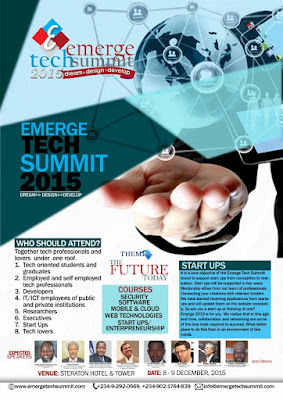 TechBooky Team Nigeria invites you to attend Emerge Tech Summit 2015 from the 8th - 9th December. This high profile international Technology Summit holds at the Sheraton Hotel & Towers Abuja, Nigeria. • Educating participants on global trends in technology development. • Creating a convergence point for technology sellers and government agencies who are potential buyers and promoters. • Equipping developers with tools and techniques for creating tomorrow’s technology. • Creating the space that nurtures creativity and innovation, as well as encouraging exchange of ideas. • Stimulating Startup Technology enterprises and attracting technology investors into Africa. This platform will also serve as an opportunity for Government Agencies and corporate organizations to bring their SMEs support offerings to the door step of these start-ups and other techpreneurs. -OPE BANWO (DR.), CEO/Afrinet Business Solutions inc.
-PAUL SHEEDY CEO/Founder Reward Technology. "See you there as we converge to make Nigeria a technology comfort zone for Africa"...Mohammed Ibrahim Jega, Co-founder Emerge Tech Summit stated the end of the press conference.